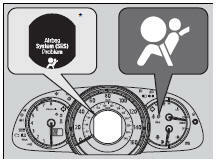 If a problem occurs in the airbag system, the SRS indicator will come on and a message appears on the multi-information display*. The indicator comes on to alert you that the passenger's front airbag has been turned off. This occurs when the front passenger’s weight sensors detect 65 lbs (29 kg) or less, the weight of an infant or small child, on the seat. 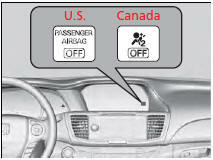 If the front passenger seat is empty, the passenger's front airbag will not deploy and the indicator will not come on. • A rear passenger pushing or pulling on the back of the front passenger's seat. • An object placed under the front passenger's seat.